Marrakesh - Moroccans protesting over the gruesome death of a fish seller have vowed to continue demonstrating until the full truth surrounding his death is known. Mouhcine Fikri, 31, was crushed to death in a rubbish truck on Friday, as he reportedly tried to protest against a municipal worker seizing and destroying his wares. "We want them [the authorities] to know that the children of this region want to end the oppression," said Faysal Awssal, a member of the Moroccan Association for Human Rights. "People here want respect for the people of Al-Hoceima. People are [politically] aware. We want an investigation that determines what happens," he told Al Jazeera in a phone interview. Nourredine el-Maalem, 47, another activist in Al-Hoceima, said that people were not only demanding a thorough investigation that will bring justice to Fikri, but also a change that will prevent these things from happening in the future. "The city is still very sad," he told Al Jazeera. "People are demanding the truth and the prosecution of those responsible for the death of the martyr Mouhcine Fikri." Last Friday evening, police had confiscated all of Fikri's merchandise - about $11,000 worth of swordfish, according to media reports - a species protected in Morocco. Moments later, Fikri and his friends tried to retrieve as much of the fish as they could. In a video recorded by a mobile phone that went viral over the weekend, his friends are seen jumping out of the lorry. Fikri, who was slightly heavier and less agile, remained stuck inside and was crushed by the grinding mechanism of the truck. A photo of his lifeless body inspired outrage nationwide. While it is still not clear what exactly happened or who activated the machine that ended Fikri's life, protests were held all over the country to demand the prosecution of those responsible for the tragedy - widely seen as an act of police brutality and oppression. 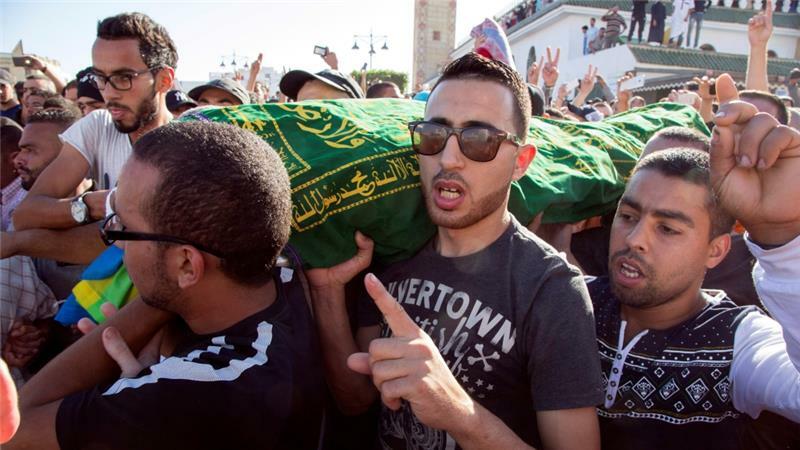 Moroccan authorities did not intervene during the protest, letting people express their outrage as Fikri's death was compared by many observers with the fate of Mohammed Bouazizi, the street vendor whose death sparked the Tunisian revolution in 2011. Prime Minister Abdelilah Benkirane called on Moroccans to end the protests. Many political parties, such as the Authenticity and Development Party, close to the palace, demanded in a statement a thorough and speedy investigation. The Moroccan Interior Minister, who presented his condolences to the family in person, also sided with the protesters. "Our King doesn't want such incidents to recur in our country," he said in a statement. "The investigation will make sure people are held accountable." Still, people of Al-Hoceima continued demonstrating on Monday - a day after thousands of people took part in the funeral procession for Fikri - hoping to press for justice. A Facebook live video showed hundreds of protesters on one of the main squares of the city chanting "Mouhcine is a Martyr" and "Down with the Makhzen", referring to the system of power in Morocco. In 2011, when protests swept the Arab world, Moroccans also took to the streets. Demonstrations, led by the February 20 movement, demanded more social justice and more freedoms but never called for a regime change. King Mohammed VI quickly responded by pushing for a new constitution that was passed after a referendum. A few years on, the country is still facing most of the problems that sparked the demands for change. Some fear that Fikri's death will ignite a new wave of protest in Morocco. Fikri's father told the Moroccan news site Hespress that the country's stability was most important to his family. On Monday, shops in the city reopened and people went back to work. Students, however, did not go to school and gathered on one of the city's main squares during a sit-in that lasted hours. Located in the north of Morocco, the Rif region has always had a complicated history with the monarchy, marked by a violent rebellion in the late 1950s that attempted to get its independence from the rest of Morocco. The Rif region, from where one of the most emblematic Moroccan leaders, Abdelkarim Khettabi, hails, has always been difficult to tame. In 1958, Hassan II, who was the 29-year-old crown prince at the time, crushed a rebellion by the Rifian Berbers in the north and severely punished leaders of the upheaval. During his reign, he neglected the region in terms of economic developments, leaving it lacking in infrastructure and access to services available in the rest of the kingdom. When Mohammed VI became king in 1999, one of his major projects was to open up the region, and many tourism and development projects were subsequently launched. "The Rif has been structurally and symbolically severed from the rest of other regions in Morocco," said Abdeslam Maghraoui, a Duke University political scientist and North Africa expert. "Language, geography, and the quest for some political autonomy has a lot to do with it." Maghraoui described King Hassan's policies towards the Rif as neglectful, if not hostile. "King Mohammed VI's more personal and conciliatory touch didn't change the deep structural problems. Today's tensions reflect this heavy legacy."